Introduction: Endoscopic resection (ER) that may be malignant deep invasion may not be suitable for ER. The submucosal colorectal carcinoma (CRC) may be needed additional treatment such as laparoscopic colonic resection (LAC), when tumors are failed to remove endoscopically. The purpose of this study was to assess the outcome of submucosal CRC (pT1 tumor) that were managed either endoscopically or laparoscopically. Method: Patients with submucosal CRC referred for ER followed by laparoscopic resection (ER/LAC group) or laparoscopic resection only (LAC group) were identified from colonic endoscopy database. Results: Seventy-nine patients were identified. The ER/LAC group was undergone for 30 patients with a mean age of 66 years, male/female ratio 2:1, and mean tumor size of 19 mm in diameter. The reasons for utilization of LAC were as follows; submucosal deep invasion (33%), lymphatic and/or vascular invasion (27%), and incomplete ER (47%). According to the postoperative pathological report, there were 23% of cancer involvement of the resection margin, and 3% of pN1 positive. One patient was identified liver metastasis and underwent partial liver resection during 966days of mean postoperative observation period (POP). The LAC group was 49 patients with mean age of 49 years, male/female ratio 1.3:1, and mean tumor size of 20 mm in diameter. 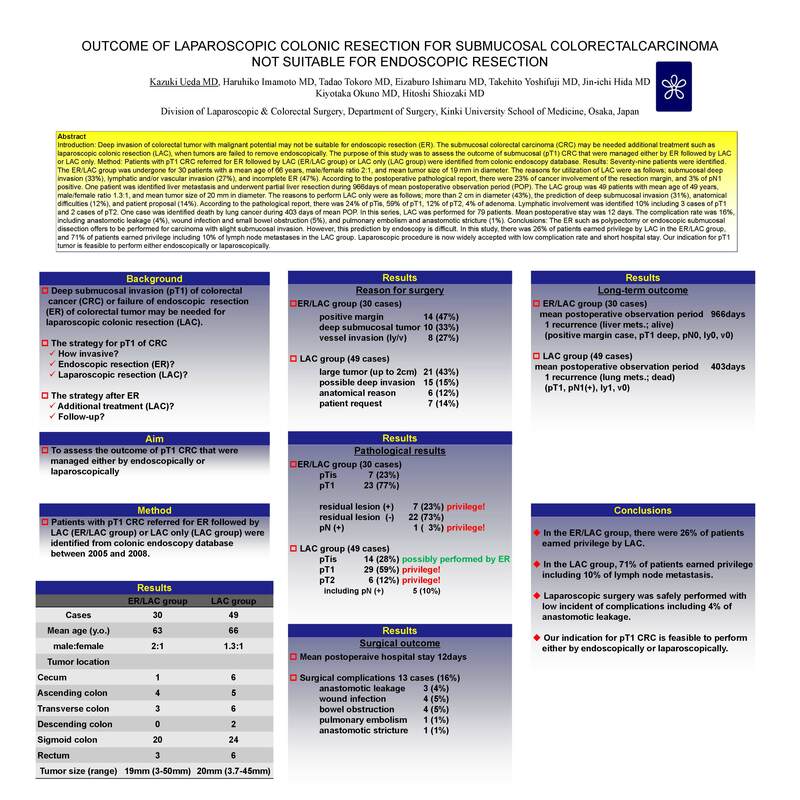 The reasons to perform LAC only were as follows; more than 2 cm in diameter (43%), the prediction of deep submucosal invasion (31%), anatomical difficulties (12%), and patient proposal (14%). According to the pathological report, there was 24% of pTis, 59% of pT1, 12% of pT2, 4% of adenoma. Lymphatic involvement was identified 10% including 3 cases of pT1 and 2 cases of pT2. One case was identified death by lung cancer during 403 days of mean POP. In this series, LAC was performed for 79 patients. Mean postoperative stay was 12 days. The complication rate was 13%, including anastomotic leakage (6%), wound infection and small bowel obstruction (5%), and pulmonary embolism and anastomotic stricture (1%). Conclusions: The ER such as polypectomy or endoscopic submucosal dissection offers to be performed for carcinoma with slight submucosal invasion. However, this prediction by endoscopy is difficult. In this study, there was 26% of patients earned privilege by LAC in the ER/LAC group, and 71% of patients earned privilege including 10% of lymph node metastases in the LAC group. Laparoscopic procedure is now widely accepted with low complication rate and short hospital stay. Our indication for pT1 tumor is feasible to perform either endoscopically or laparoscopically.